MMOs are social games. So why do they sometimes seem to work so hard to punish you for playing with other players? If I’m out hunting and another player walks by, shouldn’t I welcome his help, rather than worrying that he’s going to steal my kills or consume all the mobs I wanted to kill? Or if I want to play with someone, shouldn’t we naturally have the same goals and objectives, rather than discovering that we’re in the same area but working on a different set of quests? 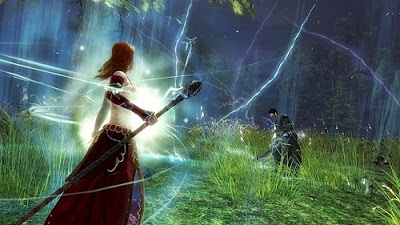 UPDATE: Arena.net has offered up another screenshot for getting the word out about the GW2 blog!